Pamela Druley Rendleman, 73, of Lenexa, KS, passed away Sept. 13, 2016 at KU Med Ctr. Memorial service will be held 2:00 pm Tues., Sept. 20, 2016 at First Presbyterian Church, 138 E. Shawnee, Gardner, KS. Inurnment at a later date at Olathe Memorial Park Cemetery. In lieu of flowers memorial contributions may be made to Cottey College in memory of Pamela Rendleman, 1000 W. Austin Blvd., Nevada, MO 64772. Pamela Druley Rendleman was born in El Paso, TX on September 30, 1942 to Dr. V.Y. and Doris (Hall) Druley. She was raised in Tonganoxie, KS where she graduated from high school in 1960. Pamela attended Baker University. She married Thomas G. Rendleman on May 12, 1963 in Tonganoxie, KS. Mrs. Rendleman was a P.E.O. and a member of the First Presbyterian Church of Gardner where she served as an Elder and Deacon. 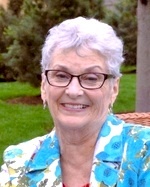 During her lifetime she served as a volunteer for the Headstart Program, a State Officer for the Jaycee Jaynes, a Den Mother for Cub Scouts in Troop 86, a volunteer at the Olathe Medical Center, served on the Citizens Advisory Board for the Olathe Police Department and Volunteer Coordinator at Olathe Police Department. She was also one of the organizers of the Amblyopia Clinic started by the Olathe Jaycee Jaynes that tested preschool children for Amblyopia. Pamela was a loving mother, friend, wife and a source of fresh air for all who knew her. She will be dearly missed by family and friends. Pamela was preceded in death by her parents. Survivors include her husband Thomas G. Rendleman and her daughters: Heidi Rendleman Storme and Stacey Storme; son, Yale T. Rendleman; three grandchildren: Jaia, Khiren and AuBrei and sister, Patricia West.